I’m going to let you in on a little secret. I’ve found the most beautiful untouched paradise. So for those who swam with elephants, lazed under palms on white sand beaches, explored palaces and ancient ruins, danced in throngs of shirtless buff men, snorkeled on tropical reefs, shopped til you dropped and stuffed your face with the most amazing food of your life, there’s one more treat in store. But this one’s for the more adventurous of you. Think Indiana Jones, think Lara Croft, think Scorpion King (Scorpion Queen if that works for you). 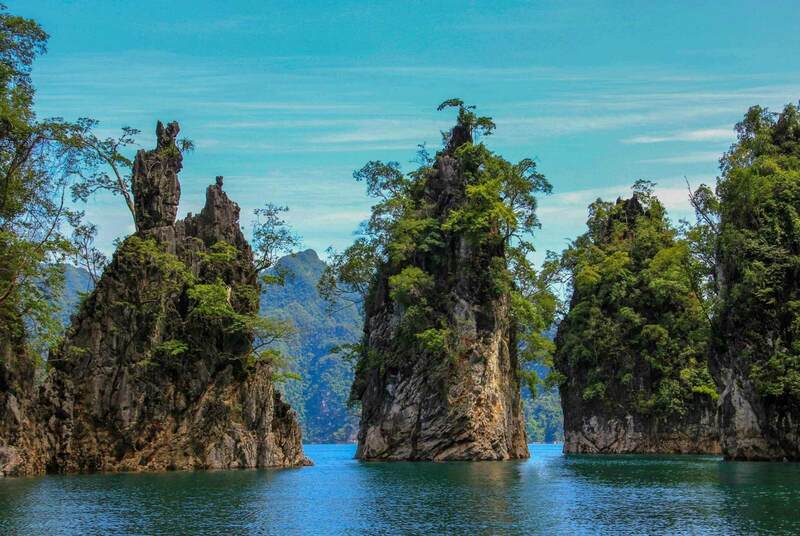 Khao Sok National Park is found in Surat Thani province between Phuket and Koh Samui (on the mainland). The park contains the oldest evergreen rainforest in the world, majestic limestone cliffs full of creepy and fascinating caves, massive biodiversity, abundant wildlife and the beautiful Chiaw Lan Lake. The original lake was expanded when a dam was built in the 1980s, forming thousands of small islands throughout. There are several sets of floating bungalows where you can stay for a night or 2 and experience utter peace and quiet and oneness with nature (aside from the howling of gibbons and chatter of hornbills). The best way to visit is via an organised tour, which you can book online or whilst in south Thailand. I booked an overnight tour. We left early in the morning, stopping at a local market on the way to buy some fruit, arriving at the lake around 9am before boarding the boat for the one hour ride to the floating bungalows. It was quite a large group of 12 people which would normally bother me however the 4 hot Spanish guys and 2 hot Russian guys made it all ok. The trip across the lake was wonderful – spectacular scenery and a wild 5 minute misty rainstorm followed immediately by clear sunny skies (thanks to microclimates formed by the extreme topography). After we dropped our bags we headed directly off for a rainforest walk. It was lovely – cool, clean and refreshing and our guide Jo managed to catch a flying lizard for us to see. Our walk took us to a hidden lake where we boarded bamboo rafts and headed to Coral Cave, named for its delicate coral like formations (I’ve seen a lot of caves – whilst this was not the most spectacular, the rock formations were fascinating and unique). We headed back to the bungalows for an amazing lunch and then spent the afternoon relaxing – swimming in the calm and crystal clear lake and kayaking. Nightfall brought absolute silence, which was blissful. Although the accommodation is very, very basic, I was so relaxed I fell into a deep and satisfying sleep. The next morning we woke early to go wildlife spotting from the boat. The wonderful sounds of gibbons howling echoed across the cliffs as we explored the shore. Early morning on the lake is paradise. We saw hornbills and monkeys playing near the water and several other species of bird (apparently there are wild elephants and many other species however you need to travel further into the park to have a chance to spot these). I also found the scariest biggest spider ever and a beautiful gold and green frog living in my bungalow roof. The rest of the morning involved more swimming and kayaking and soaking up the atmosphere before we headed off after another enormous and delicious lunch. Just one night away and I felt like a new man, fully relaxed and energized by Mother Nature at her finest. Although you’ll have to tough it a little, the reward Chiaw Lan lake provides is definitely worth it for those traveling in the south of Thailand. And of course, the fact you are LGB or T, is of absolutely no concern to anyone in this beautiful and tolerant part of the world.